UPDATE: Now if you hold any of the the three flashlight images, it will turn the LED off! Thanks DJeremyC for suggesting this! 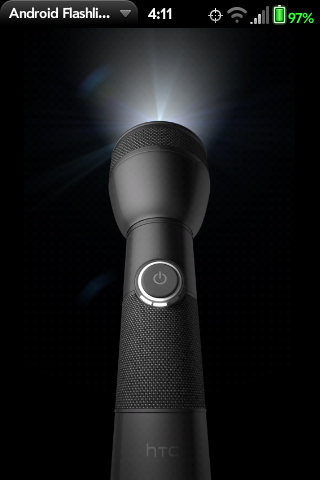 Ever since I first saw the default LED flashlight app on a friend's HTC Evo, I wanted something similar for my Palm Pre. Finally, such an app exists! With Android Flashlight, you can turn on the built-in LED on the Palm Pre by tapping the screen! This app works just like the android version, tap the screen to make it shine. Tapping it more will make it brighter and also turn it off. The first tap gives 50 mA's to the LED. The second gives 100, and the third gives 200 mA's to the LED. This application cannot make the LED any brighter than Jason's LED Torch can. Note: This app requires the SysToolsMgr Service to funtion properly. Special thanks to Jason Robitaille for creating SysToolsMgr Service and making this app possible.